Control your Swimming Pool via your IPhone, IPad, Android, or Laptop / PC anywhere in the World. IntelliPool™ uses IntelliFlo® at its best, offering the correct filtration speed for every application, improving the already exceptional energy efficiency of IntelliFlo® even further. Extra savings occur as IntelliPool™ will only add the exact amount of chemicals needed. When using salt electrolysis it will optimize the lifetime of your chlorinator cell. Control of the pool is available always and everywhere for both the pool owner and your pool service engineer. The Control System can be set up to notify you or your service company of any issues. Such as Low Chlorine, PH out of range, empty chemical tanks, high TDS, heating issues etc etc. Remote Access using Smart Phones or Internet allows you to monitor and control your pool anywhere and anytime. Wireless communication between components enables free positioning of indoor components without extra costs for providing communication cable. IntelliPool™ is the first system that fully exploits the potential of IntelliFlo® variable speed pumps in always automatically establishing the most efficient speed for every application while at the same time being as energy efficient as possible (up to 90% savings compared to conventional pumps). Less maintenance Intervention required because poolbuilders can analyze, solve and adjust many issues without the need to actually go and inspect the pool. IntelliPool™ can send an e-mail directly to the poolbuilder if one of the pools parameters exceeds its limits. Unique 2-way communication with IntelliFlo® and IntelliChlor® guarantee optimum functionality and feedback. Installation is easy and straightforward. IntelliPool™ can easily be retrofitted onto existing pools. No subscription fee for accessing pool data over smartphone or internet. Direct and remote access to colour change schemes of the IntelliBrite® 5G LED Pool lights. Cost effective dosing pumps for Cl and/or Ph control including level sensor available. 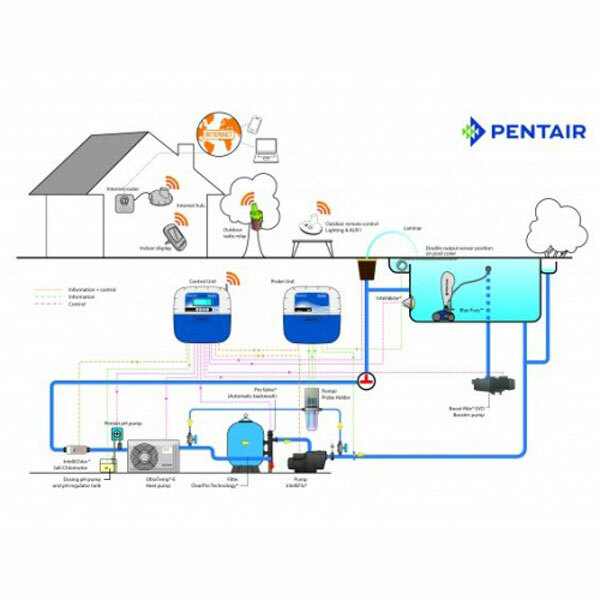 Control Unit: the heart of the system controlling your pool equipment, including RS485 communication cable for IntelliFlo®. 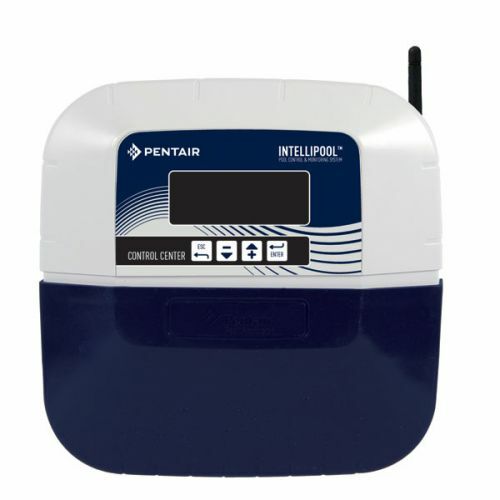 Probe Center: this unit collects info from Redox (ORP), Ph, temperature and Conductivity (Salt level) sensors as well as capturing if your pool cover is open or closed. All sensors are supplied with the system including Ph calibration fluids. Internet Hub: connected to your home internet router this unit transmits and stores your pool data onto a central server from where data can be analyzed and settings can be adjusted using internet PC or smartphone. Indoor Display: this unit shows your pool data in real time furthermore allowing remote activation of your pool lights. Remote Control: enables remote activation of your pool lights and other features (waterfall, garden lights, cleaner, etc). Radio relay: this compact unit serves both as radio relay to optimize communication between the components as well as capturing air temperature.